Photographer Jack Reznicki wrote an article on Canon's Digital Learning Center, explaining how Auto ISO enabled him to greatly improve his "keeper" rate when shooting street photography. He elaborated on the usefulness of Auto ISO and how it provided him " with maximum control over his camera in situations where the light changes dramatically and extremely quickly." "One of the things I love to do when traveling is to do street shots when riding in a car. As a long time commercial photographer, I am usually working in a studio with an art director, crew, models, and tight layouts and parameters. So shooting out of a vehicle window while speeding down the road is very liberating and exciting. It’s the complete opposite of shooting in a studio. What I really love is that it helps your “visual muscles” and your shutter finger reflexes. When the car is moving 40 to 60 miles per hour, you either get the shot or miss the shot. And when you get it, you get great drive-by, slice of life shots. Like this shot below, which I took from a fast moving SUV in the Philippines. After leading a workshop in Panama, my class thought I was crazy when they heard the click, click, click of my camera as our bus sped along the road. They all started doing the same after they saw the images at the evening review. In the old film days, and still in the digital age, I always knew that along with this type of shooting, I would have to accept great misses. I’d capture a great shot.... except for the fact that it was out of focus because of a slow shutter, too shallow of a depth of field, or the wrong exposure because we jumped from sunlight to shade too fast. Some of those missed shots just burn into your mind. When photographers get together to trade stories, one of the things they can all talk about is a great shot that they missed. Usually with film, if I “got” the shot then 30% to 50% of the time I’d be relatively happy. On a recent trip to Africa, I used my new favorite feature on both my EOS 5D Mark II and my EOS-1D X to get a greater percentage of hero shots with very few misses. I was not just relatively happy, I was deliriously happy as I got 90% or more “keeper” street shots on that trip. The feature that changed it? Glad you asked. Auto ISO. In this day and age when the cameras are built like fine computers, we can have a lot more control over our cameras and how they work. Auto ISO gives me maximum control over my camera in situations where the light changes dramatically and extremely quickly. With Auto ISO, I have several options. And I used them all to get these photos you see here. The fact is that I don’t worry about shooting at a high ISO if I need to get the shot. In the film days, ISO 800 (or “ASA” 800 for real old timers) was about as great as we could get. Oh, we could also shoot at ISO 1000 if we wanted the “fine art” affect of golf ball sized grain in our shots. With digital, I have shots that were done at ISO 1600 with “noise” that looks like a low ISO captured image. And that was the earlier digital days. Today, the technology allows us to photograph at ISOs that were simply unimaginable in the film days. Yes, I sometimes have to use noise reduction software in Canon’s DPP (Digital Photo Professional), Adobe Lightroom, Photoshop, or some other 3rd party software, but the results blow my mind. Canon’s capture technology, with their modern sensors and processing software, takes our shooting abilities to a higher level than ever before. The photo below was shot not from a speeding car, but rather in a very dark classroom with a Maasai schoolgirl in Tanzania. I shot it at ISO 25,600. That’s ISO 25,600, not ISO 256! If you look close, you can see the fly on her face above her left eye. Remarkable. Did I know I was shooting at ISO 25,600? Nope. I was shooting outside in bright sun and I quickly ducked into this schoolhouse. I shot first, looked at my settings second. But I got the shot with the background kids in a great position because the Auto ISO saved me. It’s there, the great elements in a photo altogether for one moment, and then it’s gone forever. If I stopped to readjust my settings, I would have missed the shot. Either you get it or you don’t. Luckily, my camera was set to Auto ISO. Outside, I had set my camera to manual with the shutter speed and aperture at set values and my ISO to Auto before I walked into the classroom. That’s just one of three modes I can shoot in with Auto ISO. On Manual, I set the shutter speed and aperture to the values I want and I let the ISO “float.” With AV or aperture control, I can set the aperture at the value I want and tell the camera the minimum shutter speed, up to 1/250th of a second. With the TV setting or shutter priority, I can set the shutter where I want it and the camera will set the aperture, usually the widest value in dim light. But in drive-by car shots, I want a very fast shutter speed like 1/1500th or faster and a decent aperture like f/8 or more. With the varying light that I get while traveling in a car, I get ISO speeds of 200 to 6400. 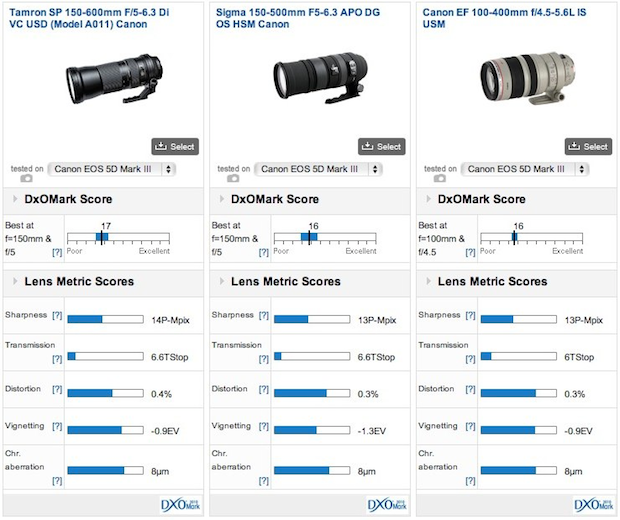 But usually it falls in the ISO 800 to 1250 range, as are the images shown here. Love it, love it, love it. If you want to read in more detail about this feature, Eduardo Angel wrote a great article, “Taking advantage of Auto ISO.” For me, Auto ISO is a hidden gem in my camera’s features and the most impactful, lately, along with the incredibly better noise at higher ISOs. As we say and demonstrate on the Canon In Action Tour, the technology today is expanding our abilities as photographers, enabling images that weren’t possible before. Better photos through better technology." Canon Inc. has surpassed the 100 million EF lens production mark with the EF 200-400mm f/4L IS USM Extender 1.4X lens. This is an amazing piece of glass, you can read my review and see my other lens recommendation here. TOKYO, Japan, April 30, 2014 - Canon Inc. today celebrated an impressive lens-manufacturing milestone with the production on April 22, 2014, of the Company’s 100-millionth EF-series interchangeable lens for EOS cameras - an EF 200-400mm f/4L IS USM Extender 1.4x. 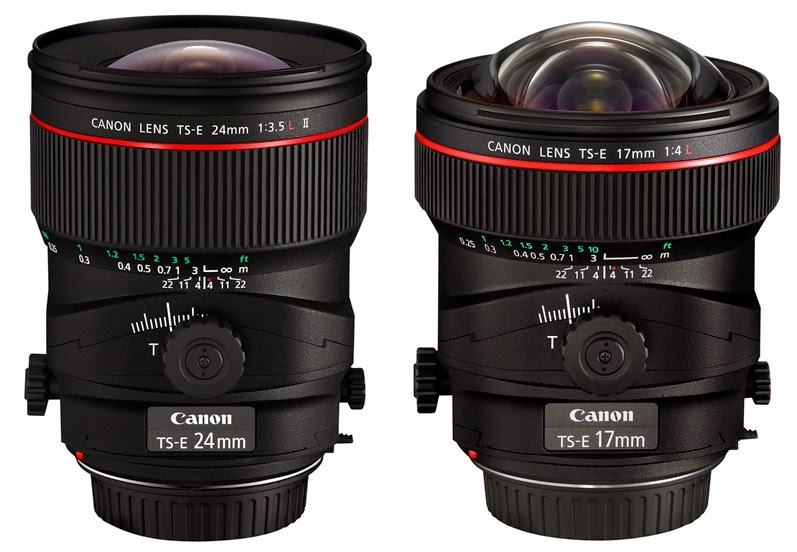 Production of interchangeable EF lenses for Canon EOS-series AF (autofocus) single-lens reflex cameras began in 1987 at the Company’s Utsunomiya Plant, which continues to play a central role in Canon’s lens manufacturing operations. 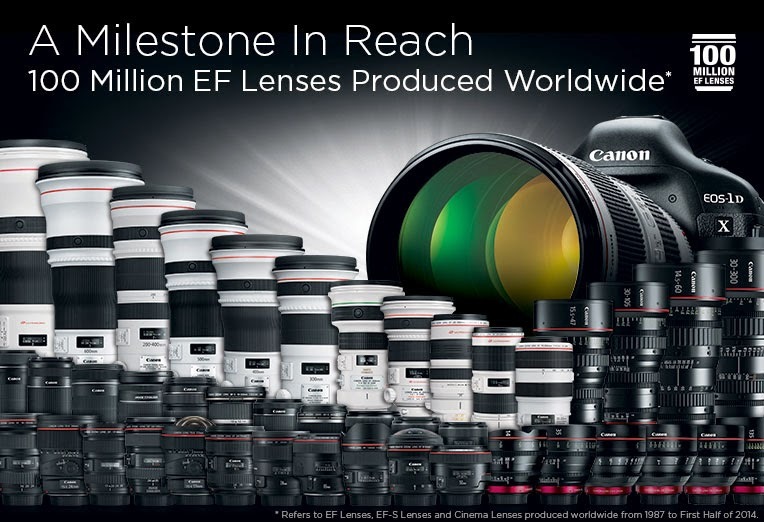 In May 2013, EF lens production surpassed the 90-million-unit mark and now, approximately eleven months later, the Company is commemorating its first-in-the-world achievement of having manufactured 100 million lenses. Canon’s proprietary EF lenses, launched in March 1987 along with the EOS SLR camera system, have continued to evolve since their introduction, leading the industry through the incorporation of a wide range of innovative technologies, including such world’s firsts as the Ultrasonic Motor (USM), Image Stabilizer (IS) technology, and a multi-layered diffractive optical (DO) element. In May 2013, aiming to further expand the realm of photographic expression, the Company introduced the EF200-400mm f/4L IS USM Extender 1.4x, the world’s first super-telephoto zoom lens with a built-in 1.4x extender that makes possible a 200-560 mm focal length range. In recent years, in addition to renewing such models as super-telephoto lenses ideal for sports and nature photography along with zoom lenses that offer a bright f/2.8 maximum aperture throughout the entire zoom range, Canon has launched multiple entry-class interchangeable lenses equipped with a stepping motor (STM) that delivers smooth and quiet autofocus performance during video recording. 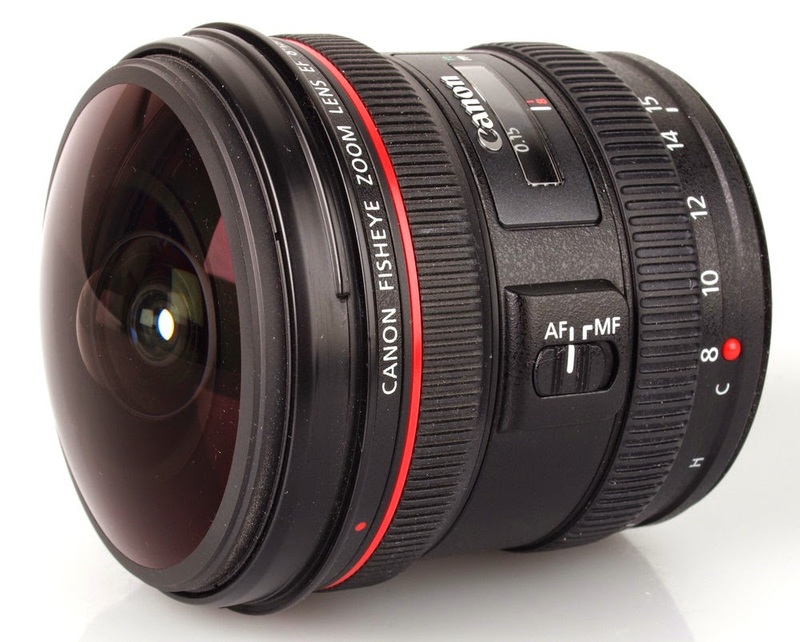 As a result, the Company’s extensive EF lens-series lineup currently comprises a total of 89 models. In addition to enhancing its lens offerings, Canon has expanded the optical technologies incorporated in its EF lenses into new fields, launching EF Cinema Lenses for digital cinematography in January 2012, and EF-M lenses for compact-system cameras in September 2012. There are stories floating around saying Canon may be working on a new generation of CMOS sensors with lower production costs and higher yields. The future use of these new sensors, depending on configuration, may include mirrorless, prosumer and professional DSLR model cameras. 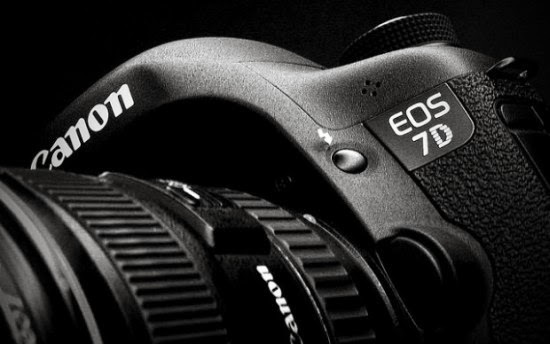 The upcoming release of the EOS-7D Mk II camera may have a more advanced variant of the current EOS-70D's 20MP sensor. Frankly, that is hardly news. Canon is a 'blue chip' Japanese company with a massive research and development budget. They rank first among Japanese companies in U.S. patents awarded 9 years in a row and is the 35th most respected company among the Global 100. Nikon is not on either list. Canon's engineers are researching on 'concept' technologies that will blow your mind, like 100+ MP sensors, etc. Of course, some of these projects will never come to fruition because they have to get pass the accountants and prove their cost vs. benefit ratio to senior management. I was in Asia last January and had an opportunity to get a hold of the new Tamron 150-600mm lens for a quick test. Recently, DxOMark tested the lens and gave it a 'thumbs up'. And now the Technical Image Press Association (TIPA) member magazines awarded the title, "Best Expert DSLR Lens" to the Tamron SP 150-600mm f/5-6.3 Di VC USD lens for 2014. 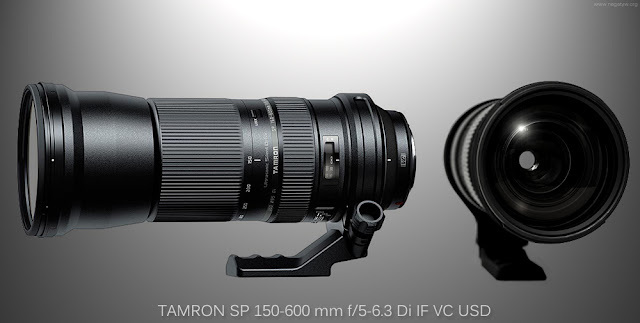 "The Tamron 150-600 mm lens, for full-frame and APS-C DSLRS (with 1.5X magnification factor) incorporates VC (Vibration Compensation, Tamron's image stabilization technology), a fast USD (ultrasonic silent drive), and eBAND (extended bandwidth and angular dependency) coating, for flare and ghosting reduction. The lens employs 20 elements in 13 groups, with the front group containing 3 ED glass elements. The circular, 9-bladed diaphragm provides exciting bokeh effects and maintains the circular shape even at 2 stops down from maximum aperture. The included SILKYPIX Developer Studio for Tamron uses optical data to correct any distortion, light falloff and chromatic aberrations." This looks very close, almost verbatim, to Tamron's glossy marketing brochures, hyping the same lens. I pay little attention to these announcements (including the recent Canon TIPA awards), when it comes from photography magazines, especially when they receive enormous amount of advertising dollars from the same manufacturers they are giving awards to. If the Tamron 150-600mm lens is the 'Best Expert DSLR Lens' for 2014, I wonder how many will be seen during the upcoming World's Cup and Summer Olympics in Brazil. It appears Tamron may be having some production issues with this lens. They are not manufactured in Japan and the initial order surge may have overwhelmed the first run. It is still not available in the U.S. as of June. Some Asian dealers are taking advantage of this 'shortage' by charging $1,400 for this mediocre glass. Once the production catches up with the preliminary demand, the price will drop below $1,000 in the U.S. Those who pay above the suggested retail price of $1,069 will find their 'investment' a fast depreciating asset soon. By the way, Tamron is a third party manufacturer and the lens is designed for full frame and APS-C 1.5X cropped frame cameras. Their engineers must basically take apart and analyze EOS cameras and lenses, and then "reverse-engineer" them to fit and operate on Canon equipment. There is no guarantee it will work flawlessly with Canon or Nikon APS-C cameras now or in the future. Canon will be announcing the EF 100-400mm f/4.5-5.6L IS II lens some time in August. This is one lens I have been waiting for years to buy. Should be a good one. I have recently come back from a wildlife photo shoot in India. Took the EF 200-400mm f/4L 1.4x lens with me. Visit my website MichaelDanielHo.com to see photos taken with all the other Canon lenses. Canon has started a new round of rebates on cameras, lenses and Speedlites. It will end on July 5, 2014. There are also a host of instant rebates that will last until May 24, 2014. 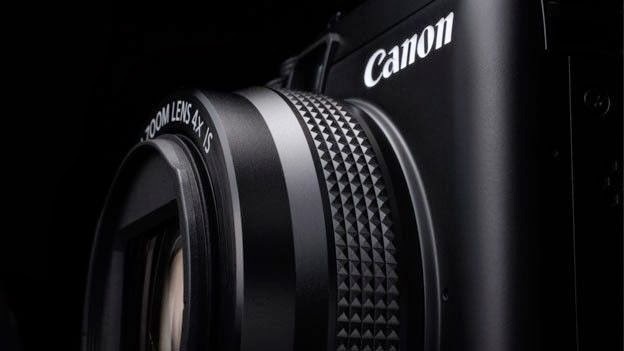 DigitalRev reviewed the Canon PowerShot G1 X Mk II and the Canon Camera Museum has put out a detailed technical report on the new camera as well. This is my favorite non DSLR camera from Canon and I may do a review on it when time permits. MELVILLE, N.Y., April 24, 2014 – Canon U.S.A., Inc., a leader in digital imaging solutions, is proud to announce that the company has received the U.S. Chamber of Commerce’s Global Intellectual Property Center’s 2014 IP Champions Award for its “Anti-Counterfeit Consumer Awareness Campaign” that highlights the dangers of counterfeit electronic goods. The campaign was recognized for the positive impact intellectual property has on the innovative process and its role in safeguarding the marketplace for consumers. The award was presented at the U.S. Chamber of Commerce’s Global Intellectual Property Center’s IP Champions Conference and Awards luncheon on April 23rd. Canon’s “Anti-Counterfeit Consumer Awareness Campaign” was launched in January 2013 to promote awareness of a consumer electronics industry-wide issue: the risks of using counterfeit accessories for digital cameras and camcorders, especially batteries and chargers. Counterfeit products are fake replicas of the real products, designed to take advantage of the superior value of the real product. Some of these fake accessories are produced in a manner that can make it increasingly more difficult for average consumers to identify. Purchase of these products can lead to potentially dangerous results. Unlike genuine products, counterfeit accessories may not meet government and industry safety standards and may overheat, smoke, melt, ignite and may cause bodily injury and property damage. With Picture Style Editor, it is easy to create your own custom Picture Style that can then be uploaded into the camera ready to shoot with. These Picture Styles will be stored in the User Def. options. Once a Picture Style is uploaded, it is still possible to make changes to it by adjusting the Parameters available in the camera – Contrast, Color Tone, Saturation and Sharpness. If you wish to revert to your saved Picture Style as created in Picture Style Editor, then select “Clear all camera settings.” This will remove any adjustments you have made in the camera to the uploaded Style, but keep the settings you made on the computer. If you need a particular combination of shutter speed and aperture to achieve a desired image effect, the Auto ISO feature will allow the ISO speed to adjust to give the correct exposure. However, leaving the ISO to adjust by itself could lead to over or under exposure depending on where you are metering from. With the latest firmware, it is possible to use exposure compensation for ISO only while the camera is set to Manual shooting. For quick access to Exposure Compensation in Manual mode, use the Custom Control menu to set the SET button to activate “Expo comp.” Now, pressing the Set button and turning the Main Dial will adjust the ISO as exposure compensation. The Minimum shutter speed in Auto ISO is very useful in P and Av modes as it avoids the shutter speed dropping below a certain level, thereby ensuring sharp images of a moving subject for example. However, if you attach a flash to the camera, you should remember that the minimum shutter speed will not be applied and you should therefore be more aware of your shutter speed as it could easily drop below an acceptable level. If you are shooting burst sequences in low light, firmware version 2.0.3 has added a +2 option for focus priority. This will likely slow the burst rate slightly, but will give the camera more time to achieve focus under poor lighting conditions to ensure a greater amount of sharp images. In bright light, where focusing is easier for the camera, try reducing the setting to 0, which may increase the burst shooting speed. 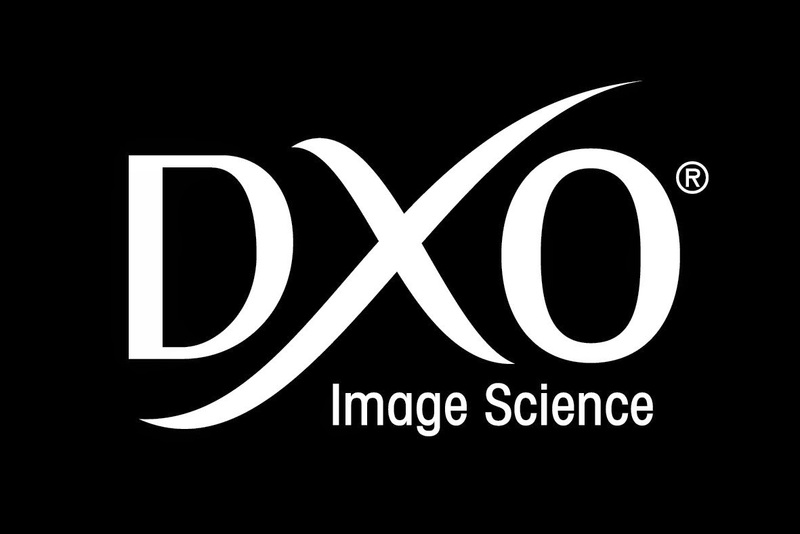 When shooting JPEG images with the EOS-1D X, it is possible to select the JPEG quality level setting for either more or less compression. By default, the camera is set to Level 8 (out of 10). If you want to get the best JPEG image quality from your camera, then in the JPEG Quality setting adjust the level to 10. If you do increase the JPEG setting, then be aware that the maximum number of images in a burst may reduce slightly due to the extra data being captured and passed through the buffer. All EOS cameras quote a maximum frame rate and in the case of the EOS-1D X, this is 12 fps in normal shooting. When a situation requires you to achieve the very maximum frame rate possible, there are some steps to take in order to ensure the best possible performance: keep the ISO speed below 25,600, use a shutter speed of 1/1000 sec. or faster and use the maximum aperture of your lens. Additionally, if you have an IS lens, turn the IS off and also make sure AF is set to One Shot. The EOS-1D X features six AF Case study settings to help you choose the most appropriate option for your subject. These case studies provide different setups for the three different AF preference settings of Tracking Sensitivity, Acceleration/Deceleration tracking and AF Point Auto Switching. When choosing a case study, and especially when modifying one, remember that if you make the settings the same as one of the other cases, it will function exactly the same - there is no underlying difference beyond what you can see. The cases are simply designed to give you a better starting point in selecting the appropriate combination of settings. When shooting movies with the EOS-1D X, it can be easier to set the shutter button and Mfn button to start and stop movie recording as it allows one-handed camera operation. If you do this, you will find that trying to take photos while recording movies is not possible. If you want to be able to capture still photos during movie recording, disable the shutter button/MFn button from being able to start and stop movie recording. The EOS-1D X features an intelligent tracking autofocus that uses the 100,000 pixel RGB AE sensor to help detect colors and faces within the frame so that they can be tracked more accurately. If you are shooting in low light – for example indoors – you may find that the frame rate is slower than expected, especially if you are trying to shoot at the full 12fps. If this is the case, and you wish to prioritize motordrive speed over AF, then turn off EOS iTR AF to increase drive speed. 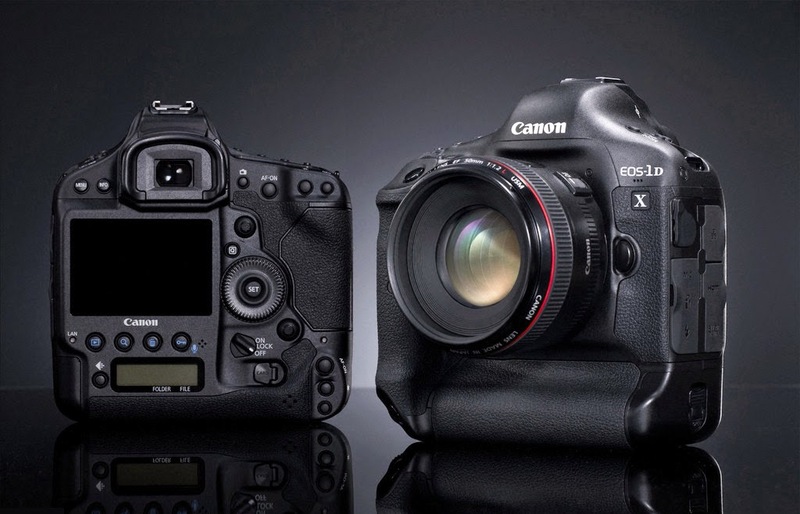 One of the benefits of the EOS-1D X is the level of customization that is available. Like several EOS models the EOS-1D X has Custom ‘C’ Modes that can store frequently used settings. If you are shooting fast-paced sports, you may find a benefit in having both a fast and slow shutter speed option setup. Using the C Modes, you can preset one for, for example, Tv (shutter priority) mode at 1/1000 sec. and be shooting in Tv mode at 1/125 sec. Using the custom controls, the M.Fn button behind the shutter button can then be configured to switch between the C modes with a simple press. You can then go from shooting pans to freezing the action without taking your eye from the viewfinder. If you have only one C Mode configured, pressing the M.Fn button will take you back to the mode you were in originally. If you shoot both stills and movies on the same memory card, it can be beneficial to keep them stored in separate folders so, when you come to download them later, they are easy to organize. If you need to switch folders quickly, using the camera menu can slow progress and requires extra button presses. With the Custom Controls on the EOS-1D X and EOS-1D C DSLRs, you can assign the SET button to directly bring up the ‘Record func+card/folder sel.’ menu, thus allowing you to switch between folders much faster. The following article is from Reuters on Canon Japan's latest quarterly sales and earnings. There is a profit improvement in Q1 of 2014, due mainly to higher office equipment revenue but camera sales fell 22% year-on-year in the quarter. 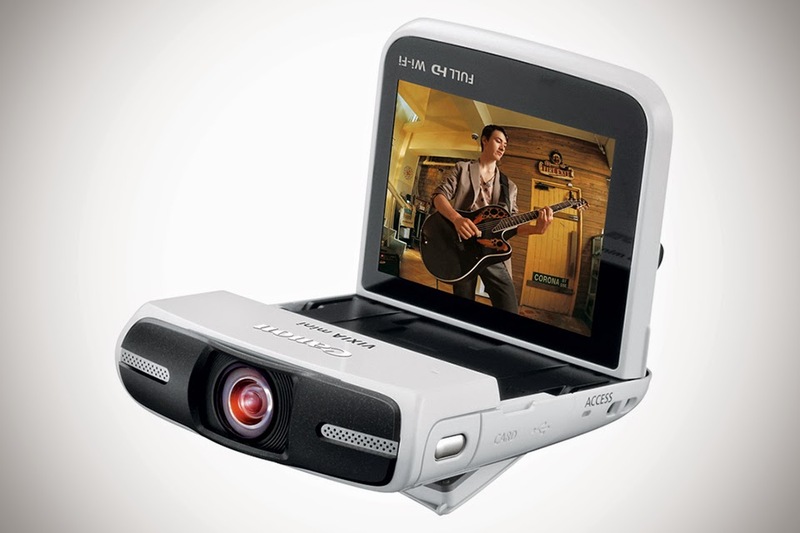 The cameras in high end smartphones are cutting into sales of low end point-n-shoot and DSLR cameras. There is rumor Canon may even exit low price compact camera market. TOKYO, April 24 (Reuters) - Canon Inc. inched up its 2014 operating profit target on Thursday due to strong sales of office copiers and printers in the first quarter, and said a reshuffle of its camera line-up had also helped boost margins. Canon said office equipment sales rose by 9.7 percent in the first quarter, helping lift operating profits by 51 percent to a higher-than-expected 82.6 billion yen ($806.76 million). Camera sales, however, fell by 22 percent year-on-year in the quarter, as the world's biggest camera maker struggled with the prevalence of high-quality smartphone cameras and a saturation in the high-end, single-lens-reflex camera market. Chief Financial Officer Toshizo Tanaka told an earnings briefing that sales of pricier compact cameras had actually increased after Canon adjusted its camera production and line-up in the first quarter to meet customers' demand for more sophisticated products. But he said a recovery would take time. "Determining whether we can achieve the growth we are hoping for will take some time," Tanaka said. "Things are getting better in China and Europe, but it will take a while to see whether that will continue." Canon forecast sales for digital cameras with interchangeable lens to reach 7.6 million units this year, a slight drop from 2013 when the models were first introduced. "After watching carefully how things go in each market through the second quarter we will re-evaluate our forecasts for the second half, our busiest period," Tanaka added. Canon said in its quarterly earnings statement it expects an operating profit of 365 billion yen ($3.56 billion) for the year to Dec. 31, a slight increase from its previous forecast of 360 billion yen. The forecast profit would be 8.2 percent higher than the previous year. With four-fifths of its sales overseas, Canon is a major beneficiary of the yen's weakening over the past year. It said the slide in the yen, triggered by Prime Minister Shinzo Abe's reflationary policies, had added 56.5 billion yen to its revenue in the first quarter. Canon expected the weaker yen to add 91.8 billion yen to its full-year sales, Tanaka said. He expected annual operating profit to increase by 16.9 billion yen, if the yen remains, on average, at 100 versus the dollar and 135 against the euro. The Technical Image Press Association (TIPA) member magazines recently convened for their General Assembly to vote for the best photo and imaging products launched by the industry in the last 12 months. The voting took place on the 5th during the General Assembly that was held from the 3rd to the 5th April 2014 in Vancouver, Canada. TIPA membership comprises 28 leading photo and imaging magazines from 15 countries on five continents, and also has a cooperative partnership with the CJPC (Camera Journal Press Club), representing 11 top photography magazines in Japan. Aimed squarely at professional sports and wildlife photographers, the Canon EF200-400mm f/4L IS USM EXTENDER 1.4x lens is a high-performance super telephoto zoom lens with an optically matched, built-in 1.4x extender. The benefit is in applications where it is not possible to change lenses quickly, while also protecting delicate equipment such as a digital SLR camera's image sensor in environments with dust and high humidity. The lens incorporates one fluorite and four UD lens elements and a 9-blade circular aperture. A Power Focus mode makes focus shifts quiet and smooth, invaluable for film-making. The lens is also highly resistant to dust and water. The Canon EOS 70D features a 20.2 CMOS APS-C sensor and DIGIC 5+ processor that can deliver up to 7 fps and an extended ISO range of 100-12,800, with an extended range to 25,600 ISO. AF is enhanced with a 19-point all cross-type AF system. The breakthrough in the EOS 70D is the Dual Pixel CMOS AF system that allows for capture of video in Live View with precise AF, as well as very fast AF operation for stills. The Vari-angle Touch Screen 3.0-inch Clear View II LCD monitor sports 1.04 million dots. Built-in wireless allows for sharing or easy upload to smartphones via the Canon EOS remote app. 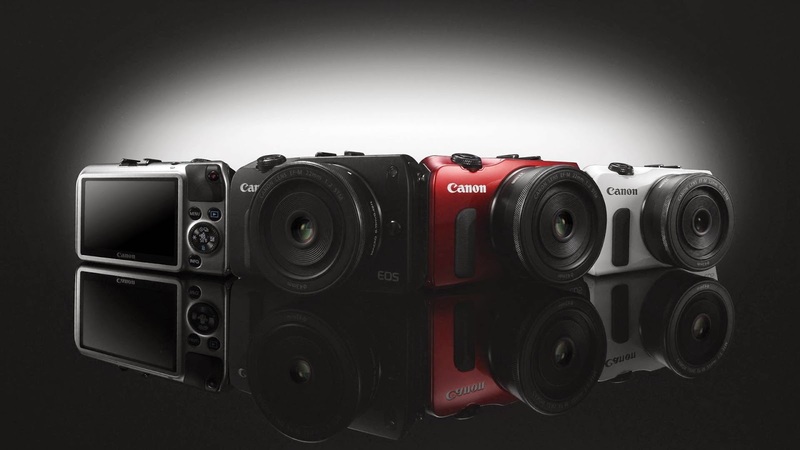 Canon PowerShot G-series cameras are always highly regarded. The latest, the PowerShot G1 X Mark II, offers 13.1 MP with a multi-aspect 1.5-type sensor, an f/2-3.9 5x zoom (24-120mm equivalent), and numerous custom functions and handling features. Capture options include 14-bit RAW plus JPEG images, with fast and accurate AF via 31 AF points. Composition options are enhanced with the 3-inch tilt-type touch panel LCD, with 1.04 million sRGB dots and 100% coverage, while exposure and camera control is expanded and enhanced via the new Dual Control Rings on the lens barrel. Full HD is available, as is Wi-Fi with NFC capability. Focusing range begins at 2 inches, full-time manual focus with focus peaking is also available. Dual Pixel CMOS AF is a phase-detection AF technology conducted directly on the image sensor plane. The benefit is achievement of dramatically improved AF performance over prior EOS cameras during Live View and video shooting. Because Live View shooting can be used in a manner similar to using the camera's viewfinder, fast and smooth AF performance is greatly enhanced. Dual Pixel CMOS AF is currently available in the EOS 70D and as an option in the C100 and C300 Cinema EOS cameras, which are in turn compatible with 103 Canon EF lenses, and we look for this advancement to allow for future development of even more responsive image capture and processing capabilities. Sigma Corporation has been on a roll lately. Their recently introduced 50mm f/1.4 Art lens received 'raved' reviews and now they are preparing an aggressive introduction at the upcoming Photokina Show on September 12 in Cologne, Germany. They may introduce the 24mm f/1.4 at the show with delivery commencing in October. In addition, Sigma may also be working on the 85mm and 135mm lens as well for future releases. 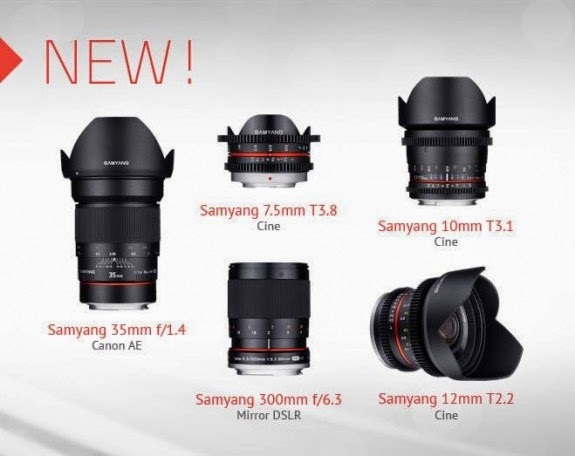 Last week, Samyang put a teaser post about their future plans on lenses. My suspicion is both 'announcements' will amount to a BIG yawn. I suppose this is the mass media age we live in. Seduce the public with tantalizing tidbits to get maximum publicity. But I prefer the old school and just announce interesting and worthwhile products. The rest will take care of itself. Canon is planning to introduce two new Tilt-Shift lens for the upcoming Photokina Show on September 16 in Cologne, Germany. The new lenses will have unique features and an "L" designation. They will include a 45mm glass and a longer focal length model as well. 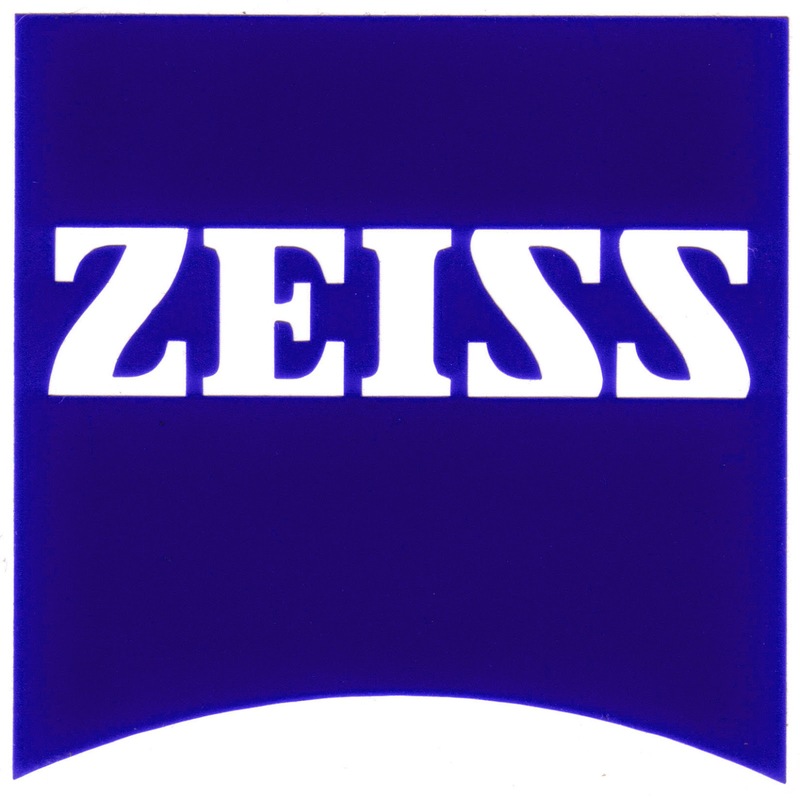 Zeiss is expanding their line of Otus lenses after the introduction of the 55mm f/1.4 last year. For the upcoming Photokina Show in Cologne, Germany this September, they are rumored to launch the 85mm f/1.4 lens, perhaps followed by the 35mm f/1.4 and even a short zoom or tilt-shift lens down the road. The third party lens manufacturers are alive and well, as demonstrated by the recent introduction of the Sigma Art 50mm f/1.4 lens and the Tamron 150-600mm f/5-6.3 lens. This should prompt Canon and Nikon to redouble their effort on basic research and development and speed up their meaningful product announcement, instead of 'wasting' time and energy on 'fluffy technologies. 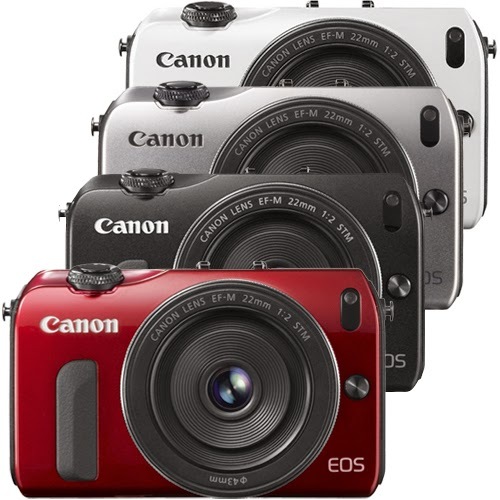 United Kingdom, 16 April 2014 – Canon today introduces a new white edition of the world’s smallest and lightest APS-C DSLR , the EOS 100D, as well as a new white version of its EF-S 18-55mm f/3.5-5.6 IS STM zoom lens. Ideal for first time users looking to explore the world of DSLR photography, the new editions to the EOS range make it easy for anyone, whatever their skill level, to capture and relive special moments in stunning detail. Measuring just 116.8 x 90.7 x 69.4mm, the EOS 100D is compact enough to always carry with you and features an 18 MP APS-C Hybrid CMOS AF II sensor and a range of simple controls and automatic shooting modes, making capturing stunning images and Full HD movies effortless. The incredibly lightweight and compact body provides a traditional DSLR shooting experience while the large 7.7cm (3.0”) ClearView II touch screen, makes it easy to adjust settings and review images straight after capture. The white EF-S 18-55mm f/3.5-5.6 IS STM lens is the perfect partner for the new EOS 100D, providing the flexibility to capture everyday subjects from sweeping landscapes to close-up portraits. An Optical Image Stabilizer ensures images are captured with impressive detail and clarity, while the near-silent STM technology also ensures noise is kept to a minimum whilst focusing in movies. 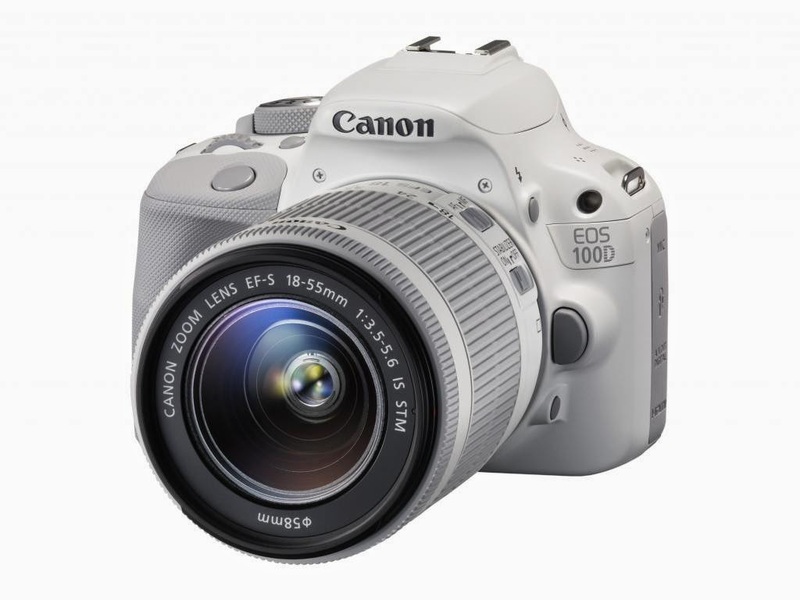 The EOS 100D White will be available from May 2014 with an MSRP of £499/€599. There is a rumor suggesting that Canon may introduced a pair of new EOS-M cameras some time in the Autumn - one consumer and one prosumer version. 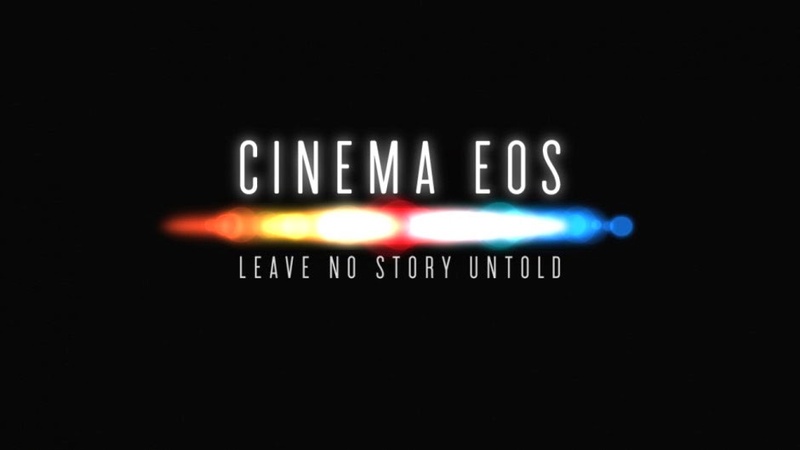 Although, in the past Canon has mentioned more lenses will be available for the EOS-M camera. This means they still have hope for the mirrorless camera system outside of Asia and the EOS-M2 may still come to North America and Europe eventually. However, I think that is the extent of their ambition when it comes to the mirrorless line. To introduce a prosumer version of the EOS-M will further blur the difference between the lower end models and make it harder for customers to decide on which camera to buy. Canon EOS-7D Mk II camera launching in Q2 - Q3, 2014? The Canon EOS-7D Mk II is one of the most anticipated cameras this year (including yours truly). It was spotted during the 2014 Winter Olympic Games. Canon has deployed many of their latest gear there and the testers were covered by Non Disclosure Agreements (NDA) so there are no firm specifications leaked about the camera. Canon may not even call its replacement - EOS-7D Mk II, but they will have enough prototypes out there to help them gain all the insights from field testing. The EOS-1D Mk IV camera with its excellent APS-H 1.3x sensor was discontinued a while back, leaving a void in the cropped frame, professional camera space. I am looking for a semi-pro body with the extra reach since I am not a big fan of extenders. The current 7D is an excellent piece of equipment and my pick, four years in a row as the best value in APS-C camera. With the successful launch of the EOS-70D, Canon is planning to use a more advanced Dual Pixel version of the 70D sensor in the upcoming EOS-7D Mk II but may be encountering some yield performance issues in the production process. There is a chance the release of the camera will be pushed back to late Q2 or Q3, with delivery commencing late Q3 or early Q4. The current EOS-7D has the most advanced AF system of all the Canon APS-C bodies. The Achilles heel of the camera is its mediocre high ISO performance. The features of the new camera will be firmed up very soon and the feedback from the Olympics are crucial in determining the final specifications. I am very fond of my EOS-7D camera and cannot wait to get the new model. You can see my works with the camera on MichaelDanielHo.com. Keep checking back for the latest information. 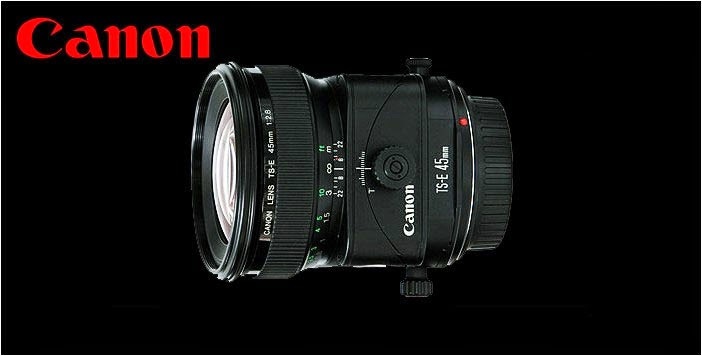 Egami, the Japanese photography blog, has discovered a new Canon patent that may be for the EF-M mount. In APS-C sensor, this design would be for a 35-75mm f/3.5-5.6 lens. 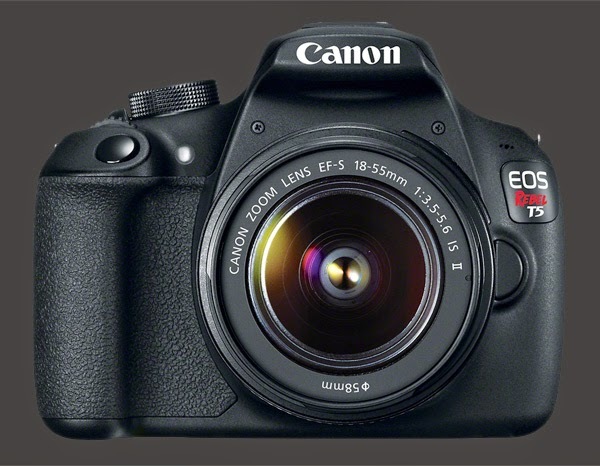 Canon Camera Museum has published the EOS Rebel T5 (EOS 1200D/ EOS Kiss X70) Technical Report. 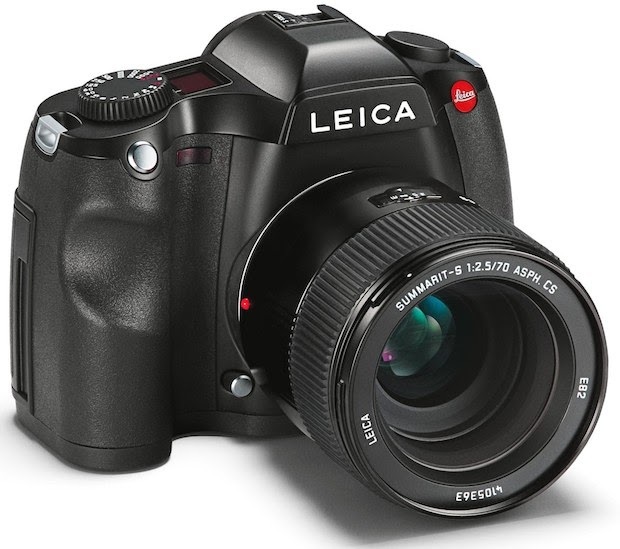 Leica S Medium Format Camera Coming at 2014 Photokina Show? Leica S Medium Format camera ? A Leica representative at the NAB 2014 Show has 'leaked' information about a new Medium Format camera, called the Leica S, that may be announced at the upcoming Photokina Show in Cologne, Germany in September. It will have a 40-50MP medium format CMOS sensor and 4K video. Considering all the recent rumors about how many companies are planning to enter the Medium Format arena, this may be another hat thrown into the ring. 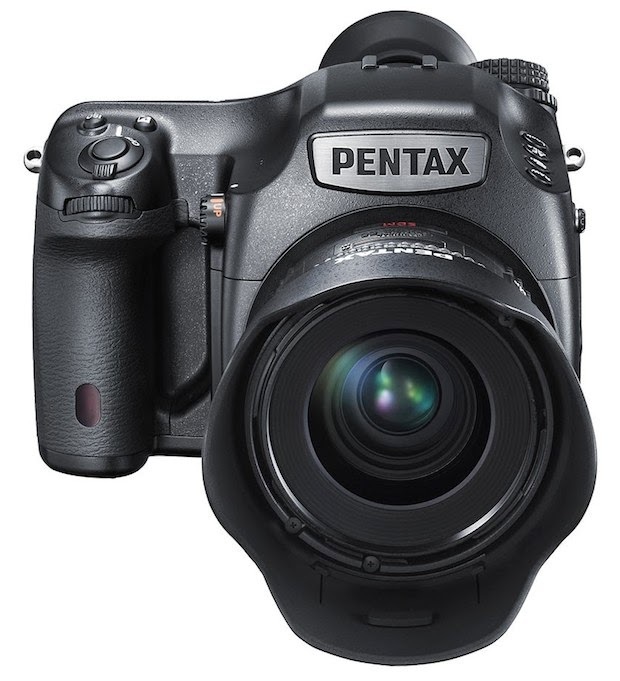 PhaseOne, Pentax and Hasselblad have all announced their Medium Format cameras based on the CMOS sensor technology. I am afraid, sooner or later, Canon may be 'forced' to enter this niche market as well. This will be an unwanted distraction and questionable strategy if it happens. Larry Thorpe of Canon USA gave an interview at the recent NAB 2014 Show. He emphasized the importance of lenses to Canon's overall strategy. There is no big surprise here, just look at one of their recent announcements. April 10, 2014, Saitama, Japan – Tamron Co., Ltd. (President & CEO: Morio Ono), a leading manufacturer of precision optics, has announced the release of an advanced new all-in-one zoom lens exclusively for digital SLR cameras with APS-C size image sensors that provides an amazing 18.8x zoom ratio. 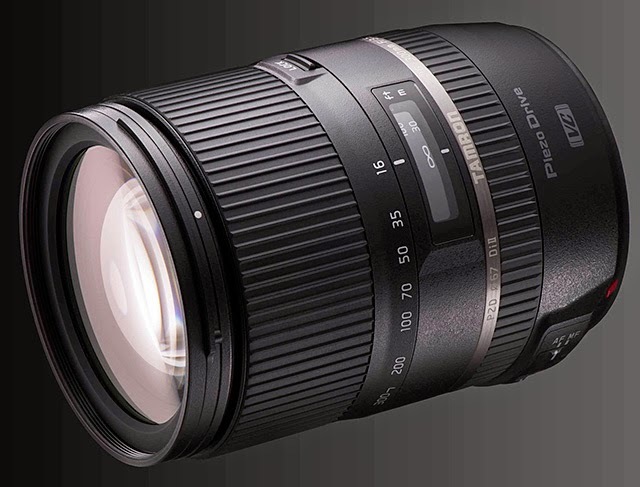 Since the launch in 1992 of the 28-200mm (Model 71D) high-power zoom lens – which featured a revolutionary compact, lightweight design – Tamron has been continually expanding its portfolio of world-class optics to benefit consumers. Tamron previously launched an 18-270mm (Model B008) all-in-one zoom lens exclusively for digital SLR cameras with APS-C size image sensors that features a 15x zoom ratio, superior image quality, swift, quiet AF, and Tamron's acclaimed VC (Vibration Compensation) mechanism, in an ultra-compact package. 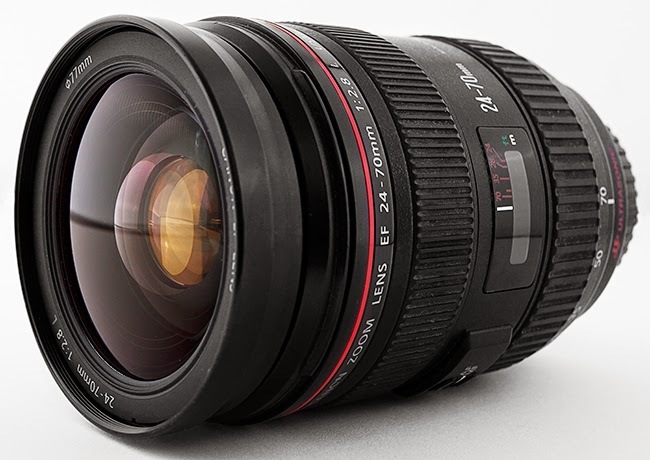 This ground-breaking lens has been winning plaudits throughout the world. Responding to consumers' demand for expanded focal lengths both at the wide-angle end of the zoom range and the telephoto end, Tamron has now developed a completely new all-in-one zoom lens design that provides an impressive focal length range extending from 16mm true wide-angle to 300mm super-telephoto. 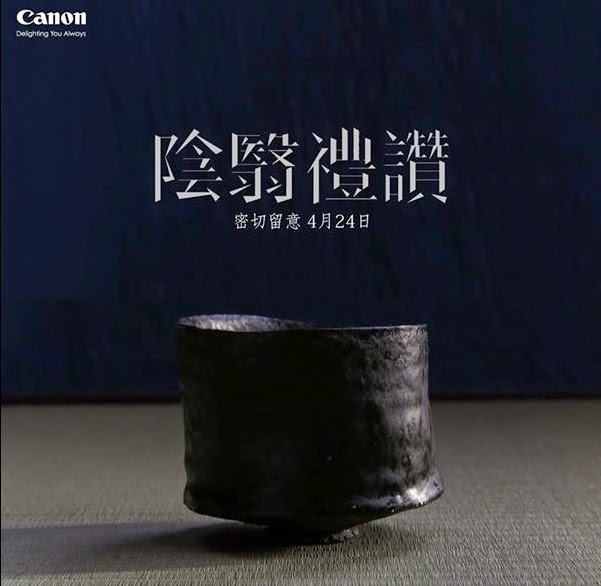 The Canon and Nikon mount models will be first simultaneously launched in the Japanese market on April 24, 2014, with overseas launches to follow in mid-May. The launch date of the Sony mount model will be announced at a later date. The list price of the lens is $629 in the U.S.
A further expansion of the imaging range. With a minimum focal length of 16mm (35mm equivalent: 25mm) at the wide-angle end of the zoom range, and a maximum focal length of 300mm (35mm equivalent: 465mm), this remarkable new lens provides the world's first zoom ratio of approximately 18.8X. The lens construction features 16 elements in 12 groups. This includes three Molded-Glass Aspherical elements, one Hybrid Aspherical element, two LD (Low Dispersion) elements, one XR (Extra Refractive Index) glass element, and one element of UXR (Ultra-Extra Refractive Index) glass, which has greater refractive index than XR. The full use of specialized glass elements in the design contributes to thorough compensation of optical aberrations. In addition, the use of the latest coating technology for suppressing reflections on lens element surfaces minimizes unwanted flare and ghosting and assures sharp, crisp, high-contrast images. A minimum focusing distance of just 0.39 meters supports an extensive range of macro photography capabilities. The new lens provides a minimum focus distance of 0.39m over the entire zoom range, with a maximum magnification ratio of 1:2.9. This makes it possible to get right up close to the subject of the photo to enjoy easy, stress-free macro photography. The PZD (Piezo Drive)*1, an advanced standing-wave ultrasonic motor system, delivers faster, quieter, more precise AF action when the autofocus is engaged. There is enhanced support for contrast-detection AF capabilities, and focusing when in live-view mode has been made smoother. The new lens also features full-time manual focus, a function that was not provided by B008, making manual focusing more convenient. Tamron's acclaimed VC (Vibration Compensation)*2 mechanism is incorporated into the new lens. *3 VC reduces image blur caused by camera shake to deliver significantly sharper images even when shooting handheld at long telephoto settings. Moisture-resistant construction for worry-free outdoor shooting. Remote viewing function has been added when using the CameraAccess plus smartphone app, with the optional CT-V1 Camera Pan Table. The CameraAccess plus app is available free of charge from the Apple App Store and Google Play. Information on how to use the remote viewing function is available from the PIXELA Web site. Shortens the time between turning the camcorder on and being able to start recording. The playback button must be pressed for half a second or more in order to access the playback mode. The playback button has now been disabled while the camcorder is in recording mode, in order to prevent inadvertently switching modes. Quick access to the photo playback index screen, by holding down the playback button, has been added. Photo playback has been added to SP-V1 mode. In the Shooting Mode menu, the “Macro” option is now listed above “Auto” for improved ease of use. Firmware Version 1.0.1.0 is for camcorders with firmware Version 1.0.0.0. If the camcorder’s firmware is already Version 1.0.1.0, it is not necessary to update the firmware. Once you have updated your camcorder’s firmware, it cannot be downgraded to a previous version. The new Canon PowerShot G1 X, Series II camera was announced on February 11. It is a slimmer and lighter weight model, powered by the DIGIC 6 processor, with a brand new electronic viewfinder and a 24-120mm f/2-3.9 zoom lens. The camera has tilt / touch screen capability and comes with WiFi. It retails for $800 in the U.S. and shipping will begin April 14. Click here to see a slideshow of sample photos taken with the new camera. The G1 X is a very capable camera and my favorite PowerShot model. This may be the only exciting PowerShot camera coming out this year. The others will probably be the dull, run-of-the-mill models coming the remainder of 2014. MELVILLE, N.Y., April 7, 2014 – Ross Video, makers of production switchers, graphics/character generator systems, and remote-control camera-support technologies, have chosen HDTV lenses from Canon U.S.A., Inc., a leader in digital imaging solutions, to integrate with Ross Video products displayed at the 2014 NAB Show, April 7-10, at the Las Vegas Convention Center. 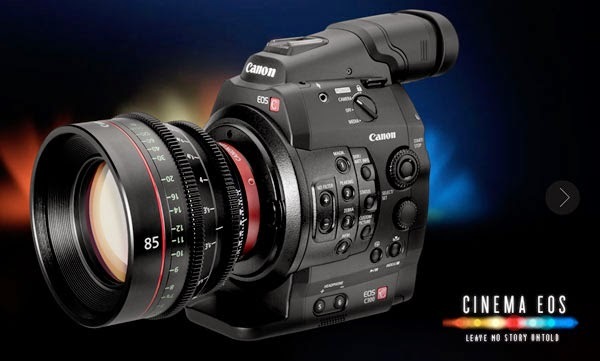 Canon XJ76x9B and XJ60x9B long-field HD zoom lenses and HJ22x7.6B HD ENG lenses will be shown with Ross Mobile Productions’ new “Future is Now 3? (FIN3) compact production vehicle, part of Ross Video’s “openTruck” initiative to meet the needs of budget-conscious producers and operators. A variety of Canon ENG lenses will be shown with Ross Robotics’ Furio and CamBot remote-control camera support systems, which utilize precision positional data from Canon lenses for integration with advanced virtual set and augmented reality applications. Ross Robotics’ Furio dolly and track-based systems as well as CamBot robotic pedestals exhibited at the 2014 NAB Show will each include a camera outfitted with a Canon portable ENG-style HD lens that can output precise positional data through its Digital Drive unit. The Digital Drive units in Canon ENG lenses incorporate Canon-developed ultra-compact rotary encoders capable of 0.1um position detection. These encoders employ Canon’s unique Micro Roofmirror Array (MRA) technology to produce 16-bit resolution of the zoom, iris, and focus control positioning for operator programming. The Digital Drive unit also includes a connector to output this lens data for use by virtual studio and augmented reality systems. Combined with additional data from Furio and CamBot systems, this Canon lens data enables the computers in virtual set and augmented reality systems to create convincing and attractive video illusions to inform and entertain viewers of TV sports, news, and many other types of programming. 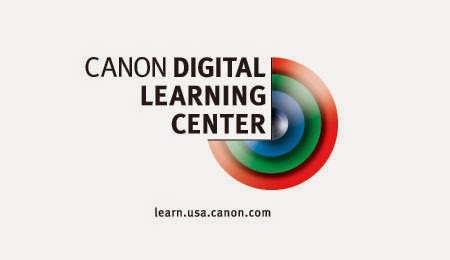 See the full Canon U.S.A. NAB 2014 exhibit in Central Hall booth C-4325 from Monday, April 7 through Thursday, April 10 at the Las Vegas Convention Center. Ross Video’s 2014 NAB Show exhibit will be located in booth N-3806 in the North Hall of the Las Vegas Convention Center.